Both links and hyperlinks are an integral part of the World Wide Web that makes you jump from one location to another within web pages or even websites via references simply called as links or hyperlinks. Links and hyperlinks are integral elements of search engine optimization (SEO) and are the founding concepts behind the World Wide Web. Everything on the Web revolves around content and how to access them. From navigating through text documents, the Web has evolved dramatically to accommodate graphics, images, and videos within web pages. Links and hyperlinks make navigating between web pages and websites easier than before thereby crosslinking trillions and trillions of pages on the Web. They are the most significant breakthroughs that make the Web so easily accessible. A link is nothing but a chain that connects pages within websites and without links there’s no website. Let’s take “http://google.com” for example. When you type this thing in the address bar, it is a link which takes you to the Google’s website. A link is nothing but a web address or a URL of a web page that allows you to connect with different servers. Links are used to connect one page to another and the behavior of a link can be specified using the CSS language. The appearance of a link may change into a hand motif in a GUI to specify that it’s a link. 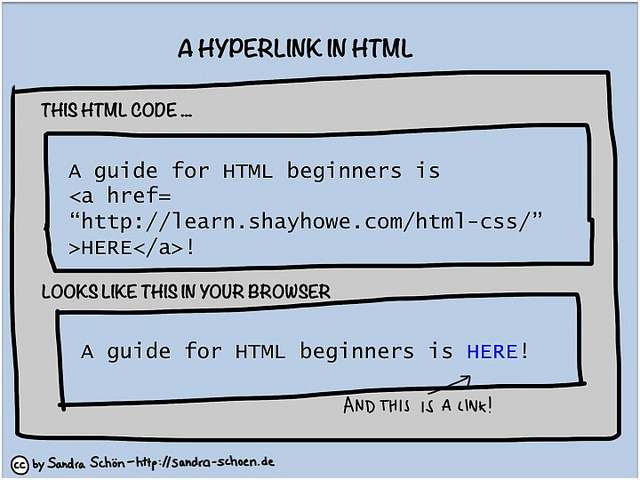 A hyperlink is a link that takes you from one domain to another via references called anchor texts. The Web is comprised of infinite number of pages filled with all kinds of content and information and hyperlink is a crosslinking tool that links those pages within same or different websites. Hyperlinks are a fundamental concept behind the World Wide Web that makes navigating between web pages easier via links. The links can be divided into internal and external links. An internal link is a link that connects two web pages within the same website, whereas an external link is used to connect two web pages that belong to two different websites. Although both look just the same, there is a thin line that separates the two in terms of internet. A link is simply an address that specifies the location of a resource on the Internet just like an URL which takes you to the web pages identified by the linked URLs. Hyperlinks, on the other hand, are links that you can click on or activate with a pointing device in order to jump to the target page. They are references that crosslink trillions of web pages and files on the internet for the sole purpose of navigating. A hyperlink can take many forms such as an icon, graphic, text, or pictures to link to another file or object within the same website or to a different website altogether. A hyperlink is simply a reference that points to a section of the same page or a different section of a different web page to access the additional information concerning the object of interest. These linked references or texts are called “anchor texts”. A link is simply the HTML control to reach the resource by a simple click or tap. Links are means of navigating between pages on the World Wide Web. The purpose of a link is ambiguous to users in general. A link identifies the address of the resource without needing additional context which makes it easy to navigate between websites. Behind every link is a URL (Universal Resource Locator) of a specific website which is nothing but the web address of the website you want to access. You can access the content of the website upon clicking the link. Hyperlinks are used to link your web page to other web pages within your home website or to access additional content or media created by other users. Let’s say we type “http://facebook.com” in the address bar. It is a plain simple link or a URL of the website that takes you to the “Facebook” website if clicked upon so that you can access all the information or content of the website. A link simply refers to the web address of a resource you wish to access. When you put this link on your web page so that anyone can navigate from your website to Facebook using Facebook as the anchor text, it becomes a hyperlink. Simply put, hyperlinks are used to navigate between web pages within same or different websites, whereas links are just web addresses. Both the terms links and hyperlinks are intertwined and often used interchangeably, but in a different context. A link when used within a web page is called a hyperlink. The purpose of both controls is same, except hyperlink control is an HTML control that provides direct access to the target website when clicked or hovered upon, whereas a link control is a server control that takes requests to the server first when clicked, before redirecting access to the target website. In simple terms, a link can be referred to simply as a web address whereas a hyperlink is a link that crosslink pages within the same or different websites in the context of the World Wide Web. Sagar Khillar. 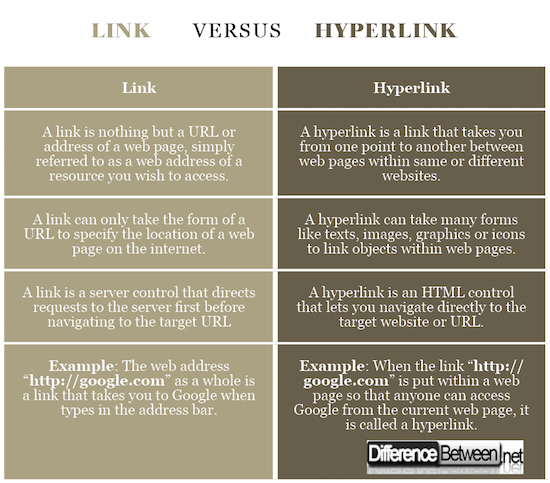 "Difference Between Link and Hyperlink." DifferenceBetween.net. June 5, 2018 < http://www.differencebetween.net/technology/difference-between-link-and-hyperlink/ >. I hate to say it but after reading this the difference is still not clear. Rather than giving a simple explanation, the same text is repeated in several ways. In the table, linking to google.com is supposed to illustrate the difference. However, the text does not make the distinction clear. A graphic that illustrates the difference might be helpful. Show what the anchor is and what each type of link refers to. It would also be helpful to have someone who does not understand the difference review this and ask questions so the author could see what needs to be clarified.